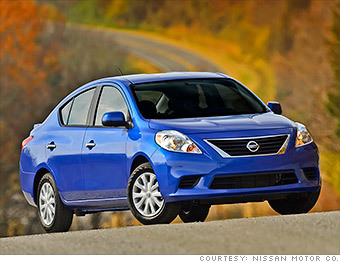 If you simply can't stomach buying a used car, here are the cheapest new cars on the market. Sometimes, an automaker redesigns a car and, somehow, it becomes less good. The Nissan Versa is such a case. I've always liked the interior roominess of the Versa and the latest version maintains that. But the look and feel inside seems less nice. The Versa was never loads of fun to drive, but the latest version is duller than a crayon in a kindergarten. It's like the engineers studiously removed whatever excitement there might once have been. Still, it's the cheapest new car you can buy today. But you can get something better for only a little more. So, for those folks who just can't bring themselves to buy a used car -- although, really, you should get over that -- here are the cheapest new cars you can buy today. Prices for cars listed in this gallery are from AOL Autos.